Storm Erik may have been raging around the Province and further afield but, thankfully, his path came nowhere near The Meadows Equestrian Centre in Lurgan where the fifth leg of the very popular Baileys Horse Feeds Flexi Eventing was taking place. Whilst the very efficient team at MEC had made all the necessary preparations by sandbagging fences, it was only the sun which made an appearance. Numbers have been increasing week on week and this time round there was a marked move from Intro to Pre Novice which is a good indication that riders feel they are making progress. That said, the large numbers meant a split in each of those two classes. Will McAuley gave his top marks in the Intro ‘A’ section to Nicky Nesbitt who has been showing continuous improvement with her eight year old mare by Crosstown Dancer and has been in the top six placings on each of their five outings. Another very consistent performer is Down High School pupil, Abby Cummiskey, with Cindy Cunningham’s ten year old Appaloosa mare, CSC Apache Dove. They finished in runner up spot in the Intro and fourth in the Pre Novice, to keep them top of the overall leader board. The ‘B’ section, judged by Angelene Nicholson, saw top points going to Nicola Martin riding Butter, her six year old mare which she has just had since September. Nicola has praised the Flexi Eventing League as an ideal training ground for young horses and looks forward to competing at a few events in the season ahead. The runner-up spot for the second week in a row was Grace O’Shaughnessey and Cooper, her twelve year old gelding, whom she also just began partnering last September. Joanne Jarden and Quarryhill Calypso took the honours in the Pre Novice ‘A’ class, Judged by Martina McKinley with Lucy Hanna and Brian, her home bred six year old by September Storm, a previous winning combination, coming in just half a point behind. Lucy also took runner up spot in the ‘B’ section with a score of 70% on Maverick, another lovely home bred and home produced horse which Lucy evented two years ago before her mother reclaimed him for dressage. However, the red rosette was reserved for Charlotte Dixon and Milo,a six year old bay gelding by Waveney whom Charlotte competed in three Intro classes last season and claimed a top placing at Kircubbin 3. Leinster Region’s John Lyttle scrutinised the Novice and Intermediate classes this week and he awarded his top Novice placing and a mark of 72.3 % to the Amateur Maestro, Denis Currie and Arodstown Aramis who are no strangers to podium finishes. Also breaking the 70% benchmark was Lucca Stubbington who is certainly making her presence felt in the dressage sections of the Flexi Eventing. She came second on Quingenti, in both the Novice and Intermediate classes. 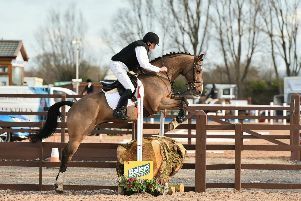 Quingenti, a ten year old gelding by September Storm and bred by John Kidd, is the current EI100 National Eventing Champion. Lucca also came out on top in the Intermediate class with Kilcannon Cool Guy, a twelve year old gelding by Loughehoe Guy, which Lucca is planning to partner at the CCI4*-S class at Tattersalls International Horse Trials at the end of May. The show jumping arena was also very busy with a general consensus that a great education had been gained as horses and ponies experienced a superb selection of coloured poles and fillers. The cross country arena was filled with a great selection of fences which gave competitors and their horses plenty to think about and provided a very valuable schooling opportunity at this stage of the year. The Flexi Eventing continues every Saturday until 2 March with points being awarded for performance and attendance with a special prize for the highest placed Riding Club/Pony Club member. This is open to absolutely everyone and, as the name suggests, riders can choose to do any or all of the three disciplines. Showjumping and cross country entries are taken on the day but dressage must be pre entered with Dora on 07876758979 or dorabeacom@live.co.uk by 6pm each Wednesday. A spokesperson added: “Sincere thanks to our sponsor, Judy Maxwell of Baileys Horse Feeds, whose commitment to this League is phenomenal, both financial and in terms of support, advice and encouragement. 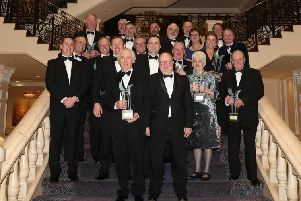 “Sincere thanks to the large team of helpers in all three arenas who ensured that the day ran seamlessly. Arena 1 – Intro ‘A’ – Judge Will McAuley: 1, Nicky Nesbitt, Carrickview Saratoga; 2, Abby Cummiskey, CSC Apache Dove; 3, Penny Murphy, Ebony; 4, Georgina Brown, Ballycreen Milady; 5, Heather Champion, Basil; 6, Lucy Toombs, Suzie. Arena 1 – Intro ‘B’ – Judge Angelene Nicholson: 1, Nicola Martin, Butter; 2, Grace O’Shaughnessey, Cooper; 3, Kirsty Jackson, Charming Lad; 4, Allison Matthews, Tadhg; 5, Katie Watson, Lissyegan Bay News; 6= Robbie Collins, Dunrath Navigator & Lynn Patterson, Just Jimmy. Arena 2 – Pre Novice ‘B’ – Judge Martina McKinley: 1, Charlotte Dixon, Milo; 2, Lucy Hanna, Maverick; 3, Nichola Wray, Lady Grey VI; 4, Kerry Magill, Cruz; 5, Olivia Johns, Lagan’s Peter; 6, Kirsty Jackson, Charming Lad. Arena 3 – Novice - Judge John Lyttle: 1, Denis Currie, Arodstown Aramis; 2, Lucca Stubington, Quingenti; 3, Kerry Magill, Toffee; 4, Hazel Hilland, Lisbane Butterfly; 5, Kathryn McKibbin, Murphy; 6, Justine Harding, Charissma. Arena 3 – Intermediate - Judge John Lyttle: 1, Lucca Stubington, Kilcannon Cool Guy; 2, Lucca Stubington, Quingenti; 3, Helen Faulkner, Danny; 4, Hannah Blakely, Clerkson; 5, Hannah Blakely, Kizzy; 6, Abi Carlisle, Monkey. 1m: Sheena Kerr-McNally, Pegasus, Meabh McIlduff, Dalsown Done & Dusted, Nicky Nesbitt, Ringfort India, Neil Morrison, Diane, Lucy Hanna, Nelly, Robbie Collins, Dunrath Navigator, Hazel Hilland, Lisbane Butterfly, Fiona Cooper, Jim, Hannah Burns, TJ, Olivia Johns, Lagan’s Peter, Emma Blair, Hi Jinx, Sarah Moore, Misty, Jordana Busby, Misty.